One thing that will get worse as the economy improves? Your commute. In 2013, Americans on average spent more than 20 additional hours in traffic, losing two-and-a-half work days to crawling on the road, according to a report from GPS device maker TomTom (TOM2). The delay was up more than two hours from the year before. 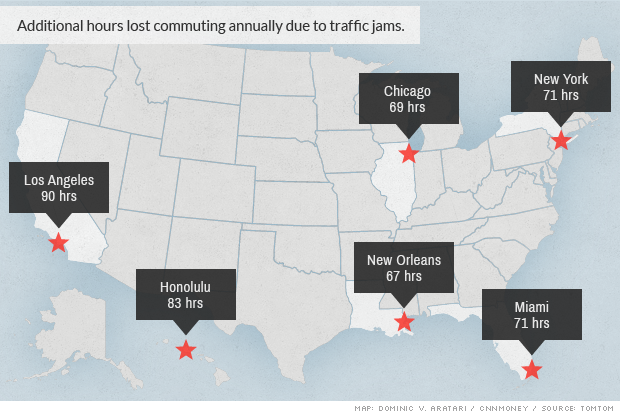 As more people hit the road traveling to new jobs, expect congestion to get worse. During the economic doldrums of the past few years, congestion improved in many cities because fewer people had jobs. "That was one way to deal with congestion -- have a recession," says Rocky Moretti, director of policy and research at The Road Information Program, an organization that studies road traffic. But, he said, "as the economy comes back, so does congestion." Drivers in Los Angeles, long known for its traffic, suffer the worst. Angelinos spend 40 extra minutes every day dealing with clogged freeways. That amounts to 90 hours, or more than 11 work days, every year. Only four of the major U.S. cities examined in the TomTom report -- Honolulu, New Orleans, Pittsburgh and Louisville -- have seen traffic congestion improve. The time lost to traffic has a price. Divers incurred up to $832 in extra costs last year, including fuel, according to TRIP. In most cities, Tuesday is the worst morning to ride in to work, and Thursday is the worst evening to head home. .
Moretti of TRIP said municipalities can improve traffic through a "balanced approach," including building roads, boosting reliance on public transportation and managing roads with better signs and signaling. For now, though, the economy seems to be growing faster than government can improve roads. "Economic growth is starting to pick up," Moretti said. "That's obviously a very positive trend, but you do need the transportation system to accommodate that growth." As bad as U.S. cities are, they're a ride in the country compared to Moscow. The Russian capital is the worst of the 138 global cities examined by TomTom, with drivers losing more than 16 work days a year in the stop-and-go.